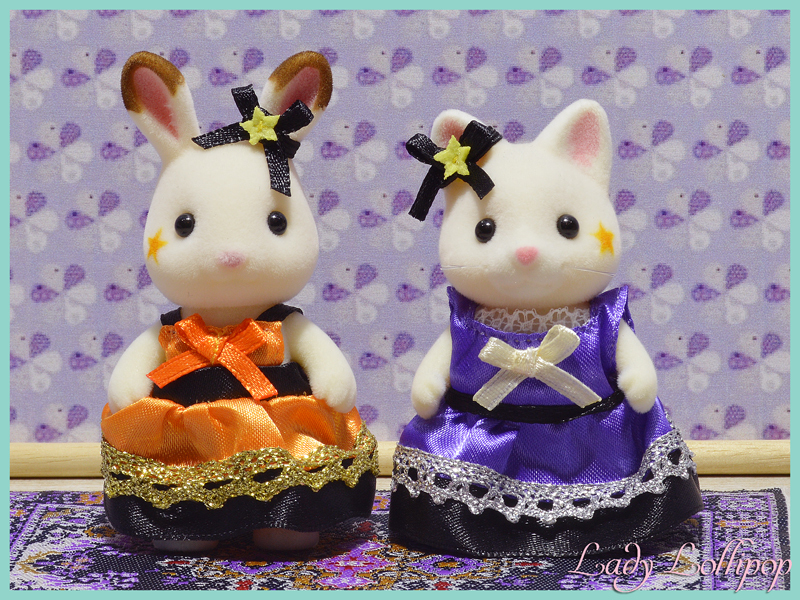 This cute seaside set includes Choclate rabbit sister Freya Chocolate and Tiffany Golightly cat sister, , in matching Halloween party dresses. The figures each have a star painted on their face and a matching bow on one ear. Items included: Cardboard press out decorations in the box insert. This website is owned by an individual for the purposes of entertainment. The facts contained in this site are to the best of my own knowledge and should not be held to an absolute. Some content of this site is copyright by LadyLollipop.co.za which include, but are not limited to, pictures, names, stories, tutorials and information. LadyLollipop.co.za is a registered distributor of Sylvanian Families. None of the Sylvanians under the Collection tab are for sale, unless otherwise stated. Sylvanian Families items for sale are located under the Online Shop tab. Sylvanian Families ™ is the registered trademark of Epoch Co. Ltd/ Flair Plc. Calico Critters ™ is the registered trademark of International Playthings Inc.